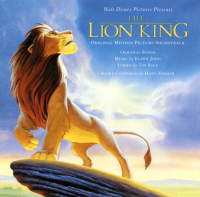 The first officially released in the US of The Lion King soundtrack in June 1994. It contains all vocal songs from the movie and most of the main peaces from the wonderful score by Hans Zimmer. But unfortunately not all parts in the movie were released. For instance even the German edition from 1994 has one more score song called "Hyena". In addition there are three songs performed by Elton John, including the Credit theme. The UK release also had 13. track "Sacrifice" included. 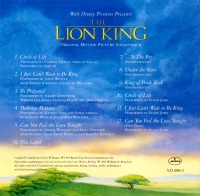 This OST was succeed by the Special Edition from 2003 and then with the Best of The Lion King CD accompanied with the Blu-Ray release. But without a doubt this is the first OST every true TLK must have in his possession.